The trade winds arrived just in time for the final day of racing at the Mark Foy Worlds in Fiji. With 20knots on the course the fleet finally got to unpack their little rigs for a day of thrills and spills. Thurlow Fisher Lawyers looked like it was going to be their day and won the first start with a port hander at the pin. From then they were unstoppable and took the win with a huge margin. The battle for second was a strong one with a group fighting for the position. It wasn’t all smooth sailing with Yamaha almost wiping out and the crew of Triple M flying around the front of their boat ending their day. In the end Howie Hamlin’s Harken finished second with Micah Lane’s Smeg third. Hamlin was excited to see the trade winds return. Having visited the area seven times before he was surprised at the light breeze during the regatta but the American still enjoyed the racing. “We had fun, we weren’t really fast in the light air. 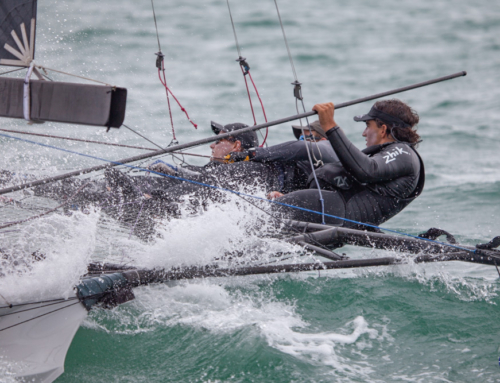 It was fun to finish in the breeze, that was what we expected all week – the trade winds,” he said. Race nine saw the overall battle between Yamaha and Thurlow Fisher Lawyers heat up. The Australian team led from the start with Yamaha waiting for their chance to make a move. A capsize by Thurlow Fisher Lawyers was that chance. Yamaha sailed away to claim the win with Thurlow Fisher Lawyers second and Compass Markets third. 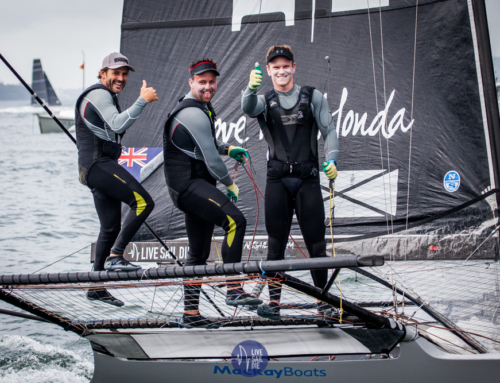 The breeze dropped ahead of the third start and the New Zealanders on Yamaha enjoyed the conditions sailing away to win the final race and the Mark Foy World Championship. Thurlow Fisher Lawyers finished second and Harken third – this was also their overall placings. By winning the Mark Foy trophy, Yamaha secured the inaugural Triple Crown Trophy after finishing second in the JJ Giltinan in February and the Anzac Regatta in April. Skipper Dave McDiarmid was excited after racing. “I’m stoked. We had a pretty good season. Last year we won the San Francisco International Regatta. We almost surprised and got second at the JJs by one point. After racing the teams took some of the locals for a spin around the race-track. It was smiles all round for the local Fiji sailors. For all the action from Fiji head to the Fiji Fizz Festival Facebook Page, for videos and full results head to http://rayc.co.nz/aklskiffleague/.